Despite claims from the payday loan industry that Americans don’t want reforms intended to prevent borrowers of these short-term loans from falling into a revolving debt trap, two new reports show that most people do think it’s time to rein in payday lending and provide more affordable loan options for borrowers in need. It’s been nearly a year since the Consumer Financial Protection Bureau proposed new payday lending reforms aimed at reducing the likelihood of borrowers needing to take out new loans to cover old ones. The CFPB offers four protections to end debt traps: a test that companies must perform before extending credit; restrictions on rollovers; a payoff option for some products; and offering less-risky lending options. The future of those rules, which have yet to be finalized, is in doubt because of the current administration’s anti-regulation stance, but the pair of new reports — both from the Pew Charitable Trusts — contend that the large majority of Americans believe the reforms are needed. According to Pew, 70% of both payday borrowers and consumers in general believe that payday lending should face more regulation than it currently does. Specifically, the borrower sentiment highlighted in the report [PDF], “Payday Loan Customers Want More Protections,” supports requiring installment payment structures that would allow them to have several months to repay debts in smaller installment amounts. The report, based on a survey of 826 borrowers, found that other reform priorities included lower prices, affordable payments, and being able to obtain small loans from banks and credit unions, not store front businesses. However, Pew notes, under the proposed rules, consumers would still likely be paying high fees on these loans, at times so high they still wouldn’t be able to afford repayment. According to this report, even if payday lenders pulled borrowers’ credit reports, used a real-time database, and had an estimate of similar people’s expenses, the total costs of the loans would still make them difficult for many borrowers to repay on time. For example, a $1,250 installment loan that is paid back over 10 months would rack up $2,450 in fees, for a total cost of $3,700. A $500, 5-month installment loan would result in $595 in fees, resulting in a total cost of $1,095. In both situations, nine-out-of-ten borrowers said this represents an unfair situation. In fact, eight in 10 borrowers tell Pew that they would instead prefer to borrower from a bank or a credit union if they knew their applications would be approved. The overwhelming majority of borrowers tell Pew they believe that banks or credit unions would offer loans that are more “fair” than those offered by payday lending businesses. When hypothetical loans from a bank and a payday lender were compared — with the bank’s $500 loan costing $125 in fees and the $500 payday loan costing $750 in fees — 93% of borrowers said they would prefer the bank-issued loan. Such a system has been in place in Colorado since 2010, Pew notes. In the case of Colorado, Pew found that credit remains widely available, but loan payments now consume an average of 4% of borrowers’ paychecks instead of 38% as was previously the case. Borrowers tell the organization they would support a similar reform that would lower interest rates and increase efficiency. 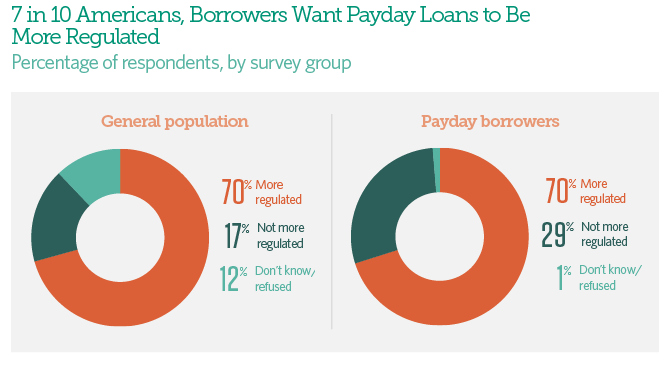 “These findings show that payday loan borrowers strongly favor reform and are especially supportive of steps that would encourage lower-cost bank and credit union loans,” the report states. This was a sentiment Pew also found when talking to consumers in general — including those who don’t use the short-term loans. According to the report [PDF], “Americans Want Payday Loan Reform,” 80% of respondents believe that the likely outcome of the CFPB’s rule — a loan that has more time for repayment but still carries a 400% APR — would be negative. However, if such a proposal allowed banks to offer alternatives the reforms could be seen as successful, 86% of respondents would use those lines of credit. In all, 70% of survey respondents say they would actually view a bank more favorably if it offered lower-cost small-dollar loans, such as a $400 loan with a $60 fee and three-month repayment window. The CFPB’s payday loan rule is currently in a holding pattern. The agency still has to finalize the regulation, and that final version could be noticeably different from what was proposed last June. Whenever the CFPB ever finalizes its rule, it will face another hurdle: The Congressional Review Act, which gives federal lawmakers a brief window during which they can vote to roll back newly finalized regulations. The CRA had only been used successfully once in its first two decades of existence, but has already been utilized more than 10 times under the new administration.